On October 10, 2013 the main location decided to make a difference in our world. After receiving an invite from Pat Nicholson, this one was a top priority. Heading into the parking lot, first thing I saw was the Miller Memorial Blood mobile. Even though the main focus was breast cancer, the overall idea was to help save lives. After that, the post office was colored pink. 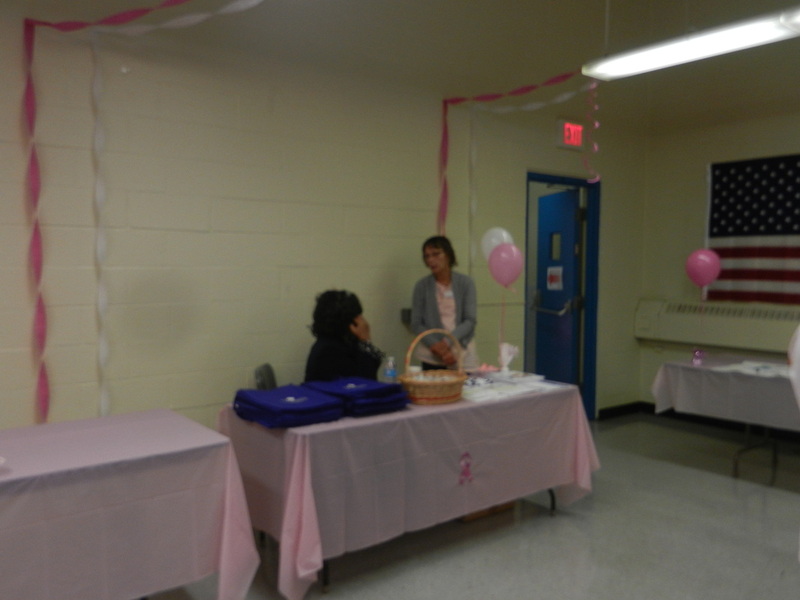 Tables were easily visible draped in pink tablecloths. Waking in, I was greeted by Pat. Everyone who arrived received a very friendly greeting. She made everyone aware of the coffee and cupcakes available. In other words: We are very glad you are here. This was sincere. The event started at 10 a.m. I arrived about 15 minutes. Turned out, things were a little behind. No big deal. Allentown mayor, Ed Pawlowski arrived and there was a dedication of a Memorial Tree. 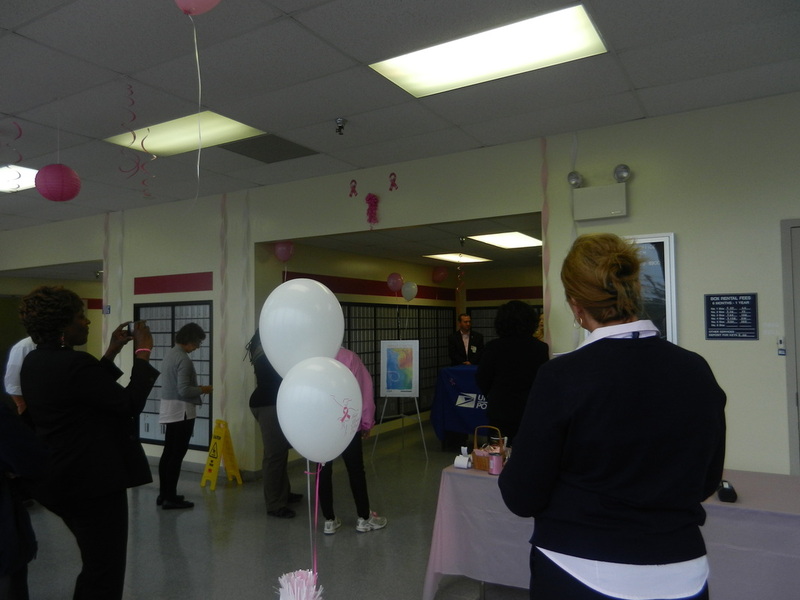 During the presentation, the history of the breast cancer stamp was given. Also a surprising fact about it: Sales of the stamp have raised 90 million (dollars) since it came out in 1998. This number goes to help research and other areas. Mayor Pawlowski included a little from the personal side. Stating how this is important to him because he is married and has children. I could tell this was sincere. Due to rain, everything was inside the post office. I have to give the mayor credit here. He was there even through a cold. After you walk in, a room was open to your left. Various organizations including Blue Cross, Allentown YMCA and Allentown Bureau of Health were there. 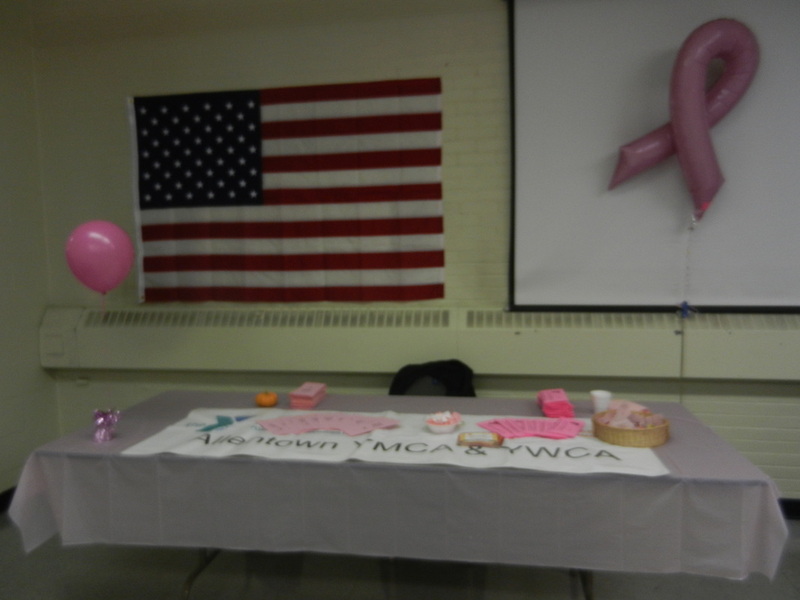 I have to make special mention of Allentown YMCA. They have free membership for survivors of breast cancer. Information was available in addition to ways you can help out. The post office had a table with a lot of information including DVDs. Here you could find out ways to protect yourself from mail fraud. You could also find out what the post office does to investigate and prevent it. I had a chance to speak with postmaster, Carrie M. Frankenfield. I asked if this was an annual event. She informed it was not. He hopes are that it will become annual. She also let me know of, hopeful, ideas to do a few other benefits throughout the year. Ms. Frankenfield also pointed out something most people may never think of. This was a great chance to to meet people behind the scenes who handle our mail. 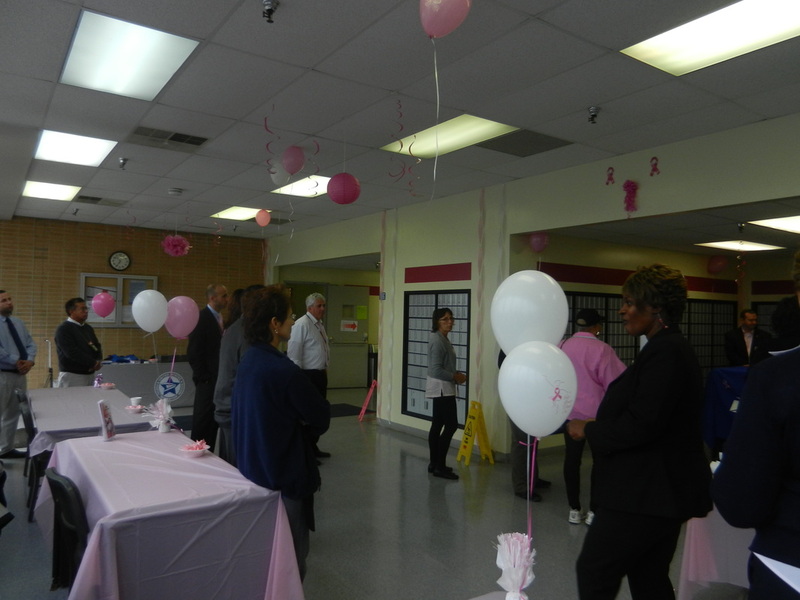 I seriously hope Breast Cancer Awareness Day, at the post office does become an annual event and continues to grow. No matter what you make think of our government. This was one occasion the system and people really showed they do care. I could tell from meeting some of the people working at the post office, the concern is genuine and real. Even though this event is over, Breast Cancer Awareness month is not. Check out the event and more information.